Midwest Mobile Waterjet is an industrial contractor that specialises in water jet cutting services using ultra-high pressure water jetting (UHPWJ) of up to 50,000psi. The water jet cutting services provided by Midwest Mobile Waterjet allow clients to cut materials without the risk of explosion or fire. The company also has comprehensive experience of working at applications, including concrete hydrodemolition, coating removal, concrete scarification, industrial cleaning equipment and silo cleaning. Midwest Mobile Waterjet’s mobile water jet cutters are used in a variety of cutting applications, including pipelines, offshore, chemical plants, reactor vessels, steel piles and fabricated metal structures. Its mobile water jet cutting tools are hydraulically or pneumatically powered and the abrasive water jet process typically uses under 3gal/min of water while cutting. Midwest Mobile Waterjet’s diesel pump units can be equipped to operate in a Zone 2 hazardous area or be located in a non-hazardous area. The company’s cutting gear are operated using pneumatic and hydraulic hoses that run into a Zone 1 or 2 hazardous area. Midwest Mobile Waterjet’s high-pressure services can be used for industrial cleaning applications. They remove product residue and failed tank linings from offshore and onshore tanks, silos and vessels. The company’s non-entry method is safer and quicker than traditional jack-hammer cleaning, as the high-pressure water jet penetrates the most built-up or clogged residue without having to enter a confined and potentially hazardous area. Midwest Mobile Waterjet’s systems can also be used to clean industrial parts or components, process equipment and adhesive substances from aluminium scaffold planks, such as cement, glue and mortar. Midwest Mobile Waterjet provides surface preparation services using equipment capable of pressures from 20,000psi to 40,000psi, which is applied using automated robotic equipment, deck machines or hand-held blasting guns. The company’s ultra-high pressure (UHP) water jetting systems efficiently remove old coatings, corrosion, soluble salt, chemicals and other substances. 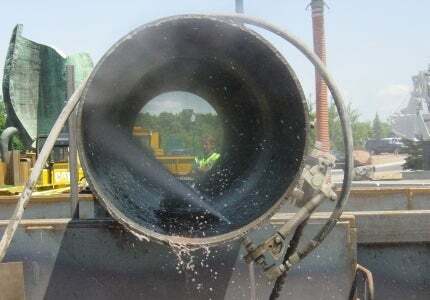 These eco-friendly systems effectively get rid of hazardous airborne dust, which makes them a suitable alternative to sandblasting, especially in sensitive environments. Midwest Mobile Waterjet’s products also remove chemical residuals and solvent films, so surfaces are clean and ready to accept new applications with maximum adhesion. The company’s UHP water jet cleaning provides a surface that fulfils the SSPC-SP12 / NACE No.5 specification. Midwest Mobile Waterjet presents an easy, quick, environmentally safe penetration of tough, built-up corrosion, elastomers, epoxy, paint, scale and other surface deposit residue without damaging underlying surfaces or substrates. The company’s surface preparation solutions incorporate ultra high-pressure water jet and water blasting machinery to eliminate chemical contaminants, microscopic solids and soluble salts with minimum volumes of water without the use of hazardous chemicals. Midwest Mobile Waterjet is a Minnesota-based contractor, which specialises in hydrodemolition, hydro-milling, hydroscarification and water jet cutting services. The company’s cutting technicians have the expertise to safely undertake all types of cutting applications, which include customised tool designs. Midwest Mobile Waterjet provides hydrodemolition, water jet cleaning, cutting and blasting services to any location in North America. The company also supplies rentable water blasting equipment with water pressures of either 10,000psi and 15,000psi. Midwest Mobile Waterjet is also an authorised representative for Gardner Denver Water Jetting Systems, a global manufacturer of water jet equipment. Midwest Mobile Waterjet developed unique waterjet cutter that was dropped between 20ft and 40ft inside the piles to cut them off 3ft below the riverbed.